Systems Connection is able to provide a full spectrum of furniture warehousing services from initial receiving and inspection to final jobsite delivery as well as storage options. Receive and inspect deliveries of furniture orders including full trailers through our 140,000 square foot, 24 bay, fully racked facility. Write up and record all orders received and enter into our specifically designed warehouse and inventory control program which generates an email notification of receipt to our customer within 24 hours upon receipt of the product. 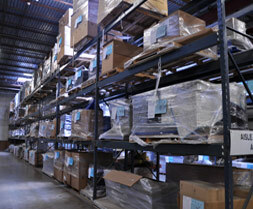 Store product in our fully racked, climate controlled, 24/7 video monitored warehouse until installation is scheduled. Long term storage is available for new product as well as existing furniture stored due to renovations. We utilize three warehouse shifts, 35 straight trucks, two tractor trailers, five forklifts and a variety of packing material to protect furniture in transport and specialized material to protect customers’ premises. We employ a per-install preparation procedure where by we unpack, sort, repack and deliver systems furniture thereby reducing on site trash and increasing on site installation efficiencies.